* Refer to the Help Guide for the details of XAVC S movie shooting features. 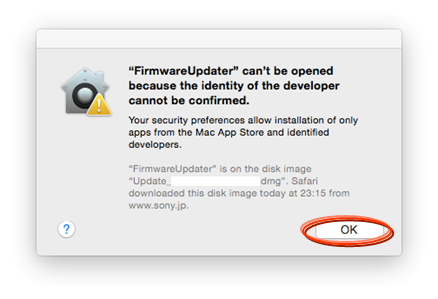 If the firmware version is Ver.2.00 or later, the update is not required. 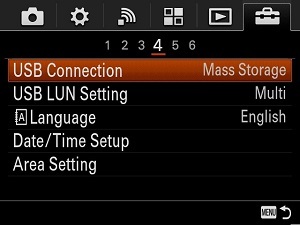 Do not cover Eyepiece sensors during the update; otherwise the LCD monitor may switch to the viewfinder. If you cannot see anything on the LCD monitor, please press [FINDER/LCD button]. The firmware update takes approximately 10 minutes, therefore prevent your computer from going into sleeping mode. In case the computer would go into sleeping mode and the update would be interrupted, redo the complete update process from the start. 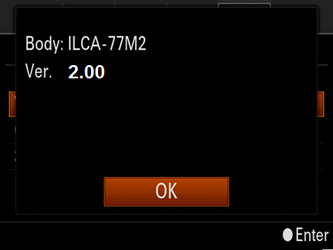 The download of the [Update_ILCA77M2V200.dmg] file will start. 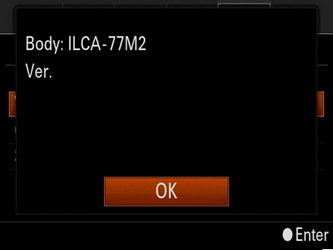 Double-click the [Update_ILCA77M2V200.dmg] file you downloaded. - Do not connect the camera at this point. Double-click the [Update_ILCA77M2V200] icon which appears on the Desktop. 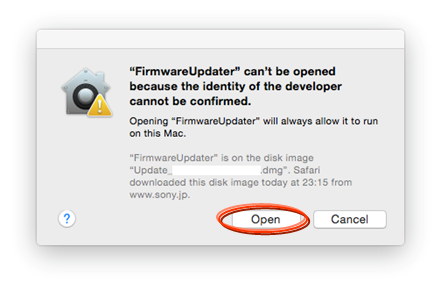 If the current firmware version is 2.00 or later, the update is not required. In this case stop the USB connection and click Finish, turn off the camera, remove the battery pack and/or the AC adapter, reinsert the battery or reconnect the AC adapter and turn on the camera. Click Run to start the update. The progress bar will appear while updating (approximately for 10 minutes). -don't turn off the camera nor disconnect the USB cable while updating. 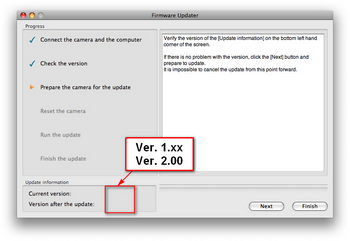 Confirm the firmware version of your camera is Ver 2.00.